Purple, Violet Hand Painted Silk Scarf AMETHYST TARTAN. Size 11x60. Birthday Gift, Bridesmaid Gift, Christmas Gift. This is a 100% Habotai silk (smooth China silk) scarf, featuring brushstrokes in several shades of purple and violet; decorated with crisscrossed metallic accents in silver. SIZE MEDIUM: This is Size Medium scarf, the perfect everyday business or casual size: 11" x 60" (28 cm x 152 cm). This is original size - slight shrinkage occurs due to the steam-setting process. Blue, Green Hand Painted Tartan Silk Scarf SCOTTISH SUMMER. Size 11x60. Anniversary, Birthday Gift. Bridesmaid Gift. Gift-Wrapped. 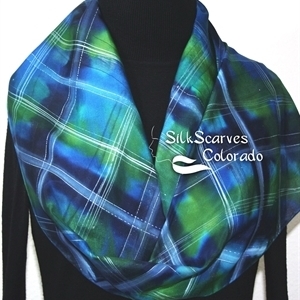 This is a 100% Habotai silk scarf featuring tartan pattern in lighter and darker shades of green and blue. Accent lines are done in silver blue and metallic white. SIZE MEDIUM: This is Size Medium scarf, the perfect everyday business or casual size: 11" x 60" (28 cm x 152 cm). This is original size - slight shrinkage occurs due to the steam-setting process.